Ok….first things first…I’m a Sony sponsored Artisan of Imagery and I have an admitted bias to Sony cameras. I am not an employee, they don’t tell me what to write or what to say and these thoughts and opinions are my own. I switched to Sony though in 2014 before I was ever sponsored by them, after using mostly Canon cameras since 1986. I saw then, and still believe, that mirrorless cameras are the future and I believe Sony is going to be the leader in a much-needed change in the industry for a variety of reasons. Now that that is out of the way, here’s the TL; DNR version: The α9 is damn near the perfect camera for wedding and event photographers, and not just sports photographers for whom the camera was initially pitched (though they will love it as well!). Frankly, it’s the camera I have been hoping for for, oh, about 35 years and Sony has created what I think will be one of the seminal cameras in the history of photography. There are a few things that I think could make it absolutely perfect and I will touch on those near the end of my review. So why do I think this is the perfect camera for wedding photographers? Let me count the ways. The thing is Silent. Silent. As in dead quiet. You simply cannot hear the camera. This is such a gift to wedding photographers who have suffered the icy stares from priests, ministers, rabbis, and the dreaded church ladies, especially when the loud of shutters of modern DSLRS would go “ker-chunk” during the ceremony (and if you think DSLRs are loud, you should have heard how loud Hasselblad's were!). Thankfully cameras have been trying to get silent over time, but nothing has gotten to this level of absolute. dead. silence. Until now. The Leica, the venerable Leica rangefinder, used to be the marker for this — in fact, in the 80s it was considered the hallmark of a quiet camera good enough for being used in a court of law. But, that camera was still not 100% silent and shooting with long lenses and at a high frame rate was nearly impossible due to the rangefinder focus (not through the lens, like the modern SLR or DSLR camera). Back in the day, the Leica (for me, anyway) was a very wide angle/normal lens camera while SLR cameras (pre-digital) were for longer lenses. Eventually though, SLR cameras became the workhorse because they just allowed you to do everything from wide angles to telephotos. But, and this is big, they were bigger than a Leica rangefinder and not as quiet. And, as digital SLRs became the norm, they became much bigger because AF made the lenses bigger. It was an ever-growing camera and lens line up built around a mirror that was needed back in the day to flip over from the viewfinder to exposing film. Think of it this way: if a Leica rangefinder combined with a full frame sports DSLR, the offspring would be the bouncing baby Sony α9! 2. Fast AF & 20 FPS! While fast AF (20 frames per second) is the much-hyped feature for this camera, it has limited applicability for wedding photographers. It’s already easy enough in this digital age to shoot and shoot and shoot. Twenty fps just makes it easier to shoot even more. BUT, there are selected times in a wedding that having 20 fps is a real godsend because it gives me extra confidence that I will deliver the image from a very fast and fleeting part of the day. Examples of that would be the first kiss, the processional, the recessional, bouquet and garter toss, breaking the wine glass (at a Jewish service) and the first dance. In conjunction to the fast 20 fps frame rate, having a large buffer that allows you to shoot 241 RAW frames or 363 jpegs is a big advantage. This was one of the weak links of smaller mirrorless cameras — they tended to bog down when there were a lot of images shot. This improvement is imperative with the faster speed of the camera. Had this feature come out with the α7R II, I bet even more wedding shooters would’ve adopted the system back in 2015. And while I’ve never had an SD card go down since switching to Sony, unfortunately I've heard that others that have. This will go a long way to allowing wedding shooters to breathe easier by having a back up created immediately upon shooting. And, one of the slots is an extra fast SD card slot which works with the newer, faster cards announced with the camera. A welcome addition for a pro grade body. This camera has great color right out of the camera and I love the look of the jpegs. They seem more vibrant, the skin tones seem more pleasing and it appears that Sony tweaks their color science with every launch. What this means for me is that the jpegs created while shooting RAW+jpeg are very good and the RAW files are superb as well. There is a new setting on this camera called Priority Set in Auto White Balance which adjusts the AWB by either biasing off the Ambient light or from White light. This seems to give a more vivid and accurate representation of the scene in Auto White Balance. One of the most amazing features of the Sony cameras is Eye AF especially for portrait shooters. This camera improves that feature because of the significant upgrade in processor speed. Even when shooting fast action, the Eye AF works and works well. Face detection seems to be improved as well. 5 axis IBIS is even steadier and it seems almost like the camera is on a gimbal when shooting. Making waist level stills or waist level video shooting easier is the way that Sony tweaked the proximity sensor so now the EVF stays on once any part of it is pulled away from the camera body. This makes low profile street shooting or discreet video shooting even easier. But the proof is in the shooting and I was able to shoot a wedding as a third shooter for my friend (and fellow Sony user) Jim Kennedy at a Hindu/Jewish wedding he was commissioned for in late May (right after the camera came out). It was like shooting two weddings in one!! I used two α9 cameras for the event and four lenses: 24-70 f/2.8 Zeiss A mount (with LA-EA3 adaptor), 70-200 f/2.8 G Master, 35 f/1.4 FE Zeiss, and the 85mm f/1.4 G Master. The camera was an absolute joy to use because the autofocus was so accurate, the speed during those fleeting special moments in a wedding was so helpful, but I have to say the best part of the experience was the fact that the camera was totally silent during both ceremonies. It was like shooting video in that the guests simply could not hear my camera make a sound. I believe that this will soon become a huge benefit and selling feature for not only wedding photographers, but people such as photographers on movie sets, golf photographers, in the White House — any photographer who needs to keep a quiet and low profile. In many ways, it was perhaps the easiest wedding photography experience that I have had because I had so much certainty on exposure (from the Live View of Settings Effects on in the EVF), precision of auto focus, and knowing that my camera was not drawing undue attention due to noise. Simply an astounding photographic experience. See more including a gallery of Paul Gero's images shot with the Sony α9 on his blog. Paul Gero has been a full time photographer since 1983 and worked for The Chicago Tribune in Chicago as well as their Washington, DC bureau, and The Arizona Republic in Phoenix, photographing everything from Presidents, political conventions, civil unrest in Haiti, and professional sports amongst thousands of assignments for publication.He has also done extensive freelance work for Sports Illustrated, People, Time, US News & World Report and other publications. 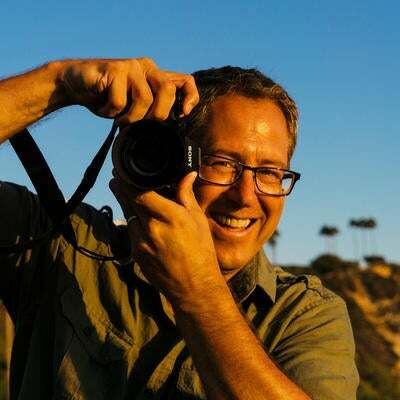 In 2002, he and his wife Nicki relocated to Southern California to open Paul F. Gero Photography, specializing in portraits, weddings and commercial work. He is the author of the book "Digital Wedding Photography" and has taught hundreds of students through his seminars and presentations. Nicki and Paul live in Ladera Ranch, CA along with their two children Kate and Matthew (AKA "Sparky"). He documents their lives on a daily basis.